Serati, Mehdi and Williams, David J. (2015). Michell–Fourier analytical treatment of stresses in the ring test under parabolic compression. In: 49th US Rock Mechanics / Geomechanics Symposium 2015. US Rock Mechanics/Geomechanics Symposium, San Francisco, CA, United States, (2875-2880). 29 June - 1 July 2015. Serati, Mehdi, Tiryaki (Erarslan), Nazife and Williams, David J. (2015). The ring test under general interior and exterior loading. In: ISRM Congress 2015: Innovations in Applied and Theoretical Rock Mechanics. The 13th International Congress of Rock Mechanics-ISRM Congress 2015, Montreal, Canada, (1-9). 10-13 May 2015. حسین شریعت علوی؛ Shariat alavi, Hossein, محمد عطایی Ataei, Mohammad, بهزاد علیزاده صوری؛ Sevari, Behzad Alizadeh, مهدی صراطی؛ Serati, Mehdi and مهدی زورآبادی Zoorabadi, Mahdi (2013) TBM shield selection in squeezing ground, case study part 2: Qomroud Tunel. Iranian Journal of Mining Engineering, 7 17: 93-106. Roshan, H., Siddiqui, M. A. Q., Regenauer-Lieb, K., Lv, A., Hedayat, A. and Serati, M. (2018). Digital multiphysics interferometry: a new approach to study chemo-thermo-hydro-mechanical interactions in geomaterials. In: 52nd U.S. Rock Mechanics/Geomechanics Symposium. 52nd U.S. Rock Mechanics/Geomechanics Symposium, Seattle, Washington, United States, (). 17–20 June 2018. Serati, Mehdi and Williams, David J. (2018). Improvements to tensile strength measurement of hard rocks. In: Programmme & Abstracts of 12th Australia & New Zealand Young Geotechnical Professionals Conference. 12th Australia & New Zealand Young Geotechnical Professionals Conference, Hobart, Australia, (40-40). 6-9 November 2018. Serati, M., Masoumi, H., Williams, D. J., Alehossein, H. and Roshan, H. (2018). Some new aspects on the diametral point load testing. In: Richard Schultz, Bill Dershowitz and Conrad Felice, 52nd U.S. Rock Mechanics/Geomechanics Symposium. 52nd U.S. Rock Mechanics/Geomechanics Symposium, Seattle, WA, United States, (). 17-20 June 2018. Xu, Youwei, Williams, David and Serati, Mehdi (2017). Effect of scalping on shear strength of aggregate. In: 51st US Rock Mechanics/Geomechanics Symposium. 51 st US Rock Mechanics / Geomechanics Symposium, San Francisco, CA, United States, (2495-2501). 25-28 June 2017. Xu, Youwei, Williams, David and Serati, Mehdi (2017). Investigation of shear strength and breakdown of mine waste rock. In: 51st US Rock Mechanics/Geomechanics Symposium. 51st US Rock Mechanics/Geomechanics Symposium, San Francisco, CA United States, (2502-2508). 25-28 June 2017. Serati, Mehdi, Masoumi, Hossein, Williams, David J. and Alehossein, Habib (2017). Modified Brazilian test for indirect measurement of tensile strength of brittle materials. In: 51st U.S. Rock Mechanics/Geomechanics Symposium. ARMA 2017: 51st U.S. Rock Mechanics/Geomechanics Symposium, San Francisco, CA, United States, (2983-2987). 25-28 June 2017. Masoumi, Hossein, Serati, Mehdi, Williams, David J. and Alehossein, Habib (2017). Size dependency of intact rocks with high brittleness: a potential solution to eliminate secondary fractures in Brazilian test. In: 51st U.S. Rock Mechanics/Geomechanics Symposium. ARMA 2017: 51st U.S. Rock Mechanics/Geomechanics Symposium, San Francisco, CA, United States, (3003-3006). 25-28 June 2017. Serati, M., Williams, D. J. and Erarslan, N. (2016). Hertzian contact damage in a hollow circular cylinder. In: ISRM International Symposium - EUROCK 2016. ISRM International Symposium - EUROCK 2016, Urgup, , (415-419). August 29, 2016-August 31, 2016. Serati, Mehdi, Williams, David J. and Tiryaki (Erarslan), Nazife (2016). Hertzian contact damage in a hollow circular cylinder. In: Omer Aydan, Resat Ulusay, Ergun Tuncay, Mehmet Ali Hindistan and Hasan Gercek, Rock Mechanics and Rock Engineering: from the Past to the Future. Eurock 2016: ISRM International Symposium, Cappadocia, Turkey, (415-420). 29-31 August, 2016. Zhu, L., Erarslan, N., Williams, D. J., Serati, M. and Ghamgosar, M. (2015). Numerical study of rock aggregate materials under various loadings. In: 49th US Rock Mechanics / Geomechanics Symposium 2015. US Rock Mechanics/Geomechanics Symposium, San Francisco, CA, United States, (681-685). 29 June - 1 July 2015. Serati, Mehdi, Alehossein, Habib and Williams, David J. (2012). Analytical and numerical study of hard rock cutting with roller disc cutters. In: Proceedings of the ASME 2012 International Mechanical Engineering Congress and Exposition (IMECE2012). ASME 2012 International Mechanical Engineering Congress and Exposition (IMECE2012), Houston, TX, United States, (). 9-15 November 2012. Alehossein, Habib, Serati, Mehdi and Williams, David J. (2012). Stress distribution inside thermally stable diamond composite picks used for abrasive hard rock cutting. In: ICDCM 2012: 23rd International Conference on Diamond and Carbon Materials, Granada, Spain, (P1.103-P1.103). 2–6 September, 2012. Hosseini, S. M. F. and Serati, M. (2010). A Computer Program for Analysing Rock Behaviour Based on the Bieniawski Criterion. In: Paul Hagan and Serkan Saydam, Second Australasian Ground Control in Mining Conference : proceedings. 2nd Australasian Ground Control in Mining Conference, Sydney, NSW, (). 23-24 November 2010. Serati, M. and Moosavi, M. (2010). Analysis of influencing factors in response spectrum of underground structures using numerical method. In: Rock stress and earthquakes : proceedings of the Fifth International Symposium on In-situ Rock Stress. 5th International Symposium on In-situ Rock Stress and Earthquakes, Beijing, China, (579-583). 25–27 August 2010. 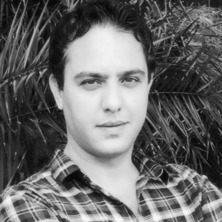 Mehdi Serati (2014). Stiffness and Strength of Rock Cutting and Drilling Tools – Drag Bit and Roller Disc Cutters PhD Thesis, School of Civil Engineering, The University of Queensland.